UPDATE: The details of President Obama’s executive action on immigration were revealed on November 20, 2014. Read this post for to see who will be eligible for deportation relief under the new programs. Millions of unauthorized immigrants could receive relief from deportation under an executive action that President Obama will announce as early as next week, according to news reports. The decision is expected to affect immigrants who have already been living in the country for a long period of time and is aimed at families in which some members are U.S. citizens and others are not. If it happens, it would be the most significant protection offered to unauthorized immigrants since 1986, when Congress passed a major immigration bill that allowed about 2.7 million unauthorized immigrants to obtain a green card, with many ultimately gaining U.S. citizenship. Currently, an estimated 1 million unauthorized immigrants have temporary relief from deportation through either the Deferred Action for Childhood Arrivals program or having Temporary Protected Status. One proposal mentioned is to extend deportation relief to unauthorized immigrants who are parents of children who are U.S. citizens or permanent legal residents. The plan could offer immigration relief to either those who have lived in the country at least five years or those who have lived in the country a decade or more, news reports said. 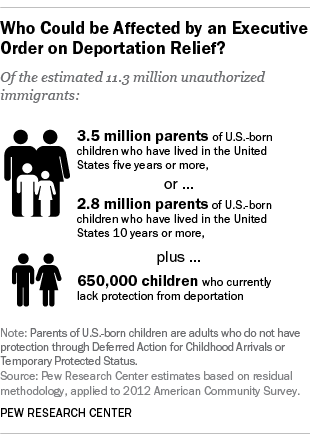 There are about 2.8 million unauthorized adults with U.S.-born children currently living with them at home who have lived in the country 10 years or more but don’t have protection from deportation, according to Pew Research Center estimates. If the executive action affects those who have lived in the country for only 5 years or more, an additional 700,000 immigrants could receive protection, for a total of 3.5 million, according to our estimates. The plan may also include deportation relief for those who came to the U.S. as children. Among only those under 18, there are 650,000 unauthorized immigrant children who currently don’t have protection from deportation. Some political analysts have said the president’s decision to delay executive action on immigration may have affected Latino turnout on Election Day. Latinos had mixed feelings about the decision. About a third (35%) of Latino registered voters said they are disappointed or angry with the decision, while one-fourth (26%) said they are very happy or pleased, according to our survey in October. After Republicans won control of the Senate and House last week, Obama reiterated his pledge to take executive action on immigration before the end of the year. But he faces renewed opposition, as Republicans this week promised to try to block the move, with one group of lawmakers proposing to stall a spending bill that needs to be passed by the end of December. The new policy is expected to be the biggest immigration change of Obama’s presidency and his boldest use of executive power. Republicans have criticized Obama in the weeks leading up to the announcement, calling any significant change to immigration policy an overreach of his executive authority. Congress has not made progress on a major immigration bill since June 2013, when the Senate passed a measure that would create a path to citizenship and funded increased security at the U.S.-Mexico border. To date, Obama’s most significant immigration policy change has been 2012’s Deferred Action for Childhood Arrivals (DACA) program, which provides temporary relief from deportation and a two-year work permit to qualifying young adults ages 15 to 30 who were brought to the U.S. illegally as children. Some 120,000 unauthorized children and 475,000 unauthorized adults have received temporary deportation relief under the program. Another estimated 400,000 unauthorized immigrants have deportation protection because they have Temporary Protected Status. But the administration has been criticized for also deporting record numbers of unauthorized immigrants. A record 438,421 unauthorized immigrants were sent home in fiscal year 2013, and on average, more than 400,000 immigrants have been deported annually since 2009. Under the Bush administration, there were about 252,000 deportations a year, though that number rose to about 360,000 during Bush’s last year in office. Among Latinos, deportation relief is seen as more important than a pathway to citizenship for Latinos. Some 56% of all Latinos said this while 35% said a pathway to citizenship is more important, according to our survey. Meanwhile, the U.S. general public overall supports some form of legalization for unauthorized immigrants. According to a Pew Research Center survey in October, by 71% to 25% the public backed offering unauthorized immigrants an opportunity to gain legal status if they meet certain requirements. Among Hispanics and the general public, majorities said it is important for immigration reform to happen soon. Three-quarters (74%) of Hispanics this year said it is extremely or very important for Congress to pass significant new immigration legislation soon, according to our survey conducted in October. Among the general public, our July survey found 61% said it is important to pass significant immigration legislation in 2014. But there is a wide partisan gap among the public as to how immigration reform should be approached. More than half (53%) of Republicans said the priority should be on better border security and stronger law enforcement, compared with just 19% of Democrats who said the same, according to a Pew Research Center poll conducted in August. By contrast, 33% of Democrats favored prioritizing a path to citizenship for unauthorized immigrants, compared with 9% of Republicans. Some 45% of Democrats and 36% of Republicans said both approaches should be given equal priority. Correction: A previous version of this post referred to the president’s implementation of his new immigration policy as an executive order. He has taken executive action.